The Washington Capitals may have ended the Vegas Golden Knight's fairy tale season by defeating them in the Stanley Cup Final but their latest move shows just how classy of an organization they are. 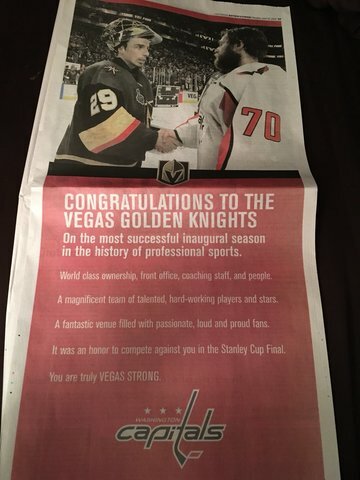 The Capitals took out a full-page ad in the Las Vegas Review-Journal to congratulate the Golden Knights on a historical expansion season.
" Congratulations to the Vegas Golden Knights on the most successful inaugural season in the history of sports. World class ownership, front office, coaching staff, and people. A magnificent team of talented, hard-working players and stars. A fantastic venue filled with passionate, loud and proud fans. It was an honor to compete against you in the Stanley Cup final. You are truly VEGAS STRONG." An extremely classy gesture from a world-class organization.